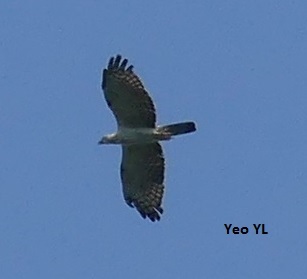 Two (2) Chinese Sparrowhawks/Goshawks outside Kin Villa spotted at 7.40am as we headed out for breakfast on Day 7th of the official Raptor count. 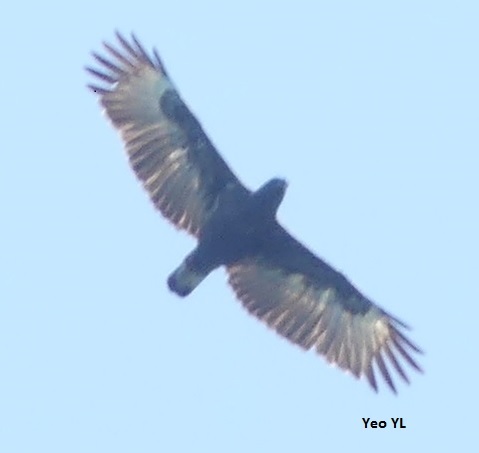 The count started on 29th February 2016. 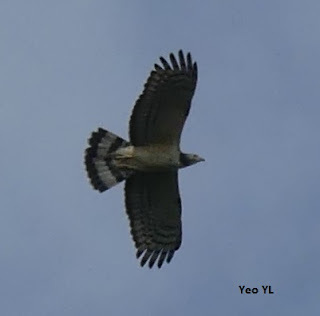 Goodbye and safe journey to our friends from Singapore, Jacky, Andy, Han and Alyce. 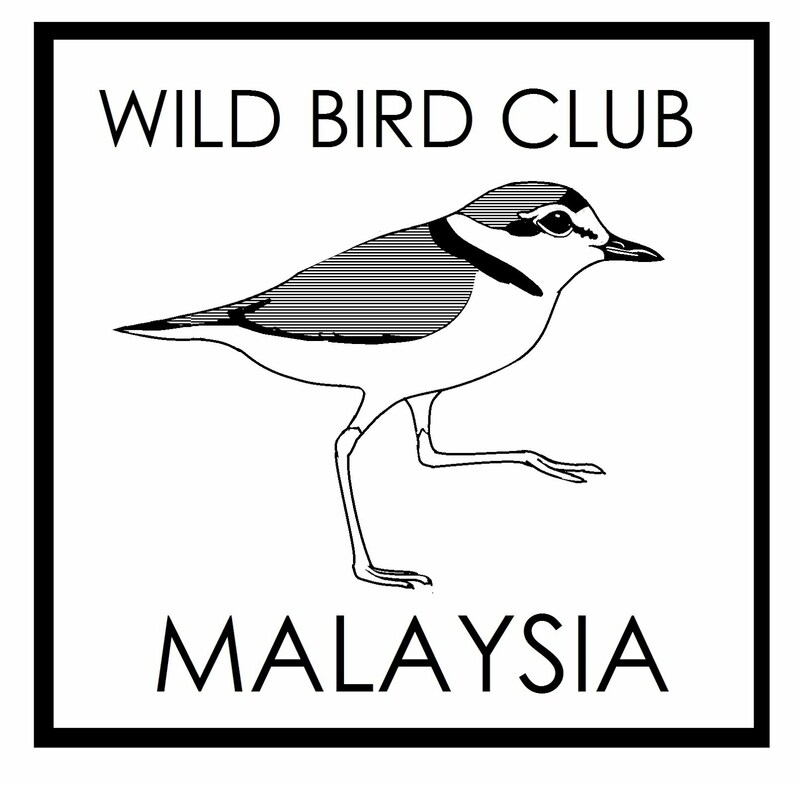 We had a good dinner together with them on Saturday night at Kim's Restaurant in Port Dickson Waterfront (and ice-cream at CocoMoo in Weng Yin's for dessert:). 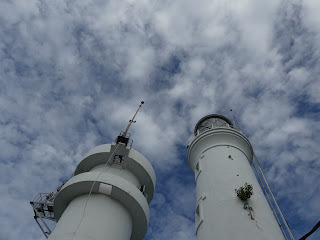 Our Singaporean friends left Tanjung Tuan after breakfast as myself, OT and CY headed to the Tanjung Tuan lighthouse. Hawksbill turtle came up for air amongst the rocky waters below the lighthouse that Sunday. 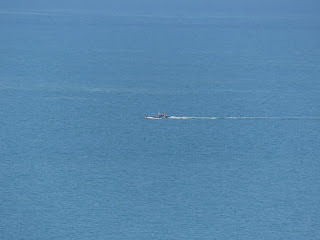 Schools of fish were seen around these waters since yesterday Saturday. The Cherry Tree (and parasol) below provided us much protection against the blazing sun that weekend. 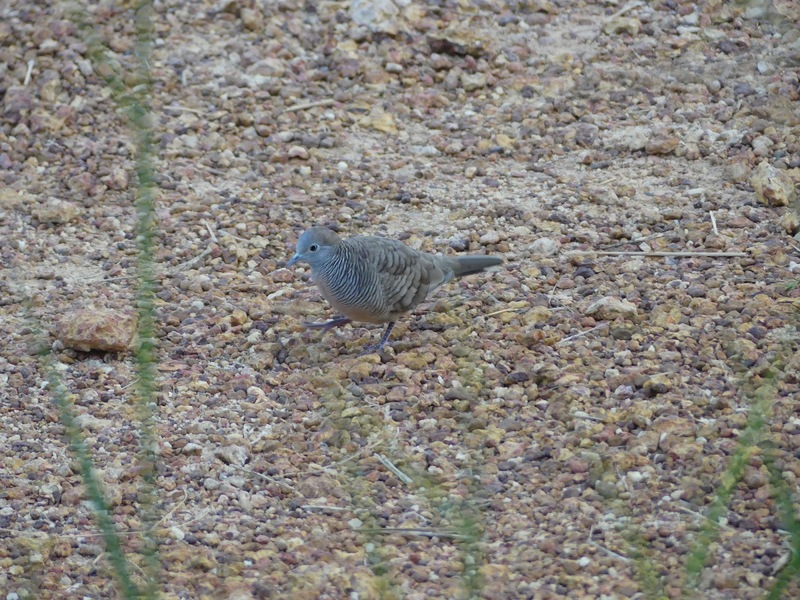 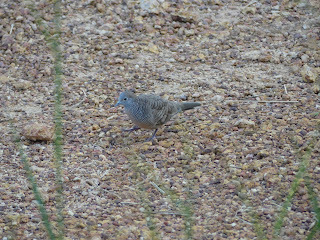 The peaceful dove just outside of Kin Villa, looking for breakfast. At the lighthouse, a Common Myna was splashing about on a plate of water left outside for it by the lighthouse staff. 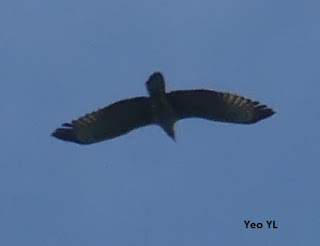 Interesting to observe this Javan Myna coming later to chase away the Common Myna. 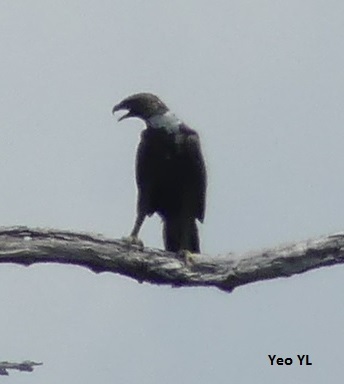 The Common Myna sounded very agitated when it flew off and the sound it made was very different from the Javan. My Garden Birdwatch 2015 infographic made an interesting finding about the Common and Javan Myna since the latter is becoming an invasive species in Malaysia, with the former not being so "Common" anymore. 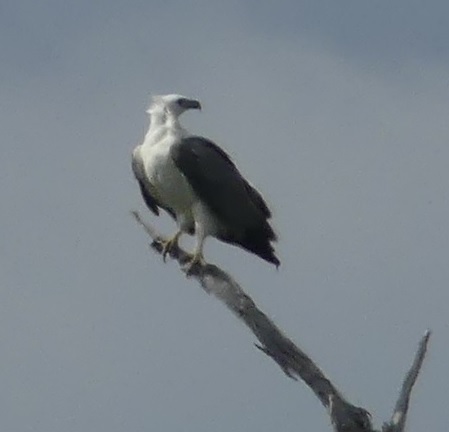 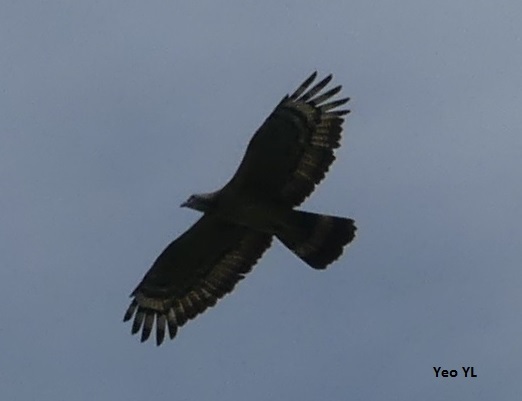 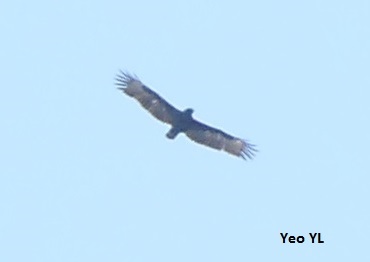 The White-Bellied Sea-Eagle, the largest local raptor in Malaysia was flying high that Sunday morning. 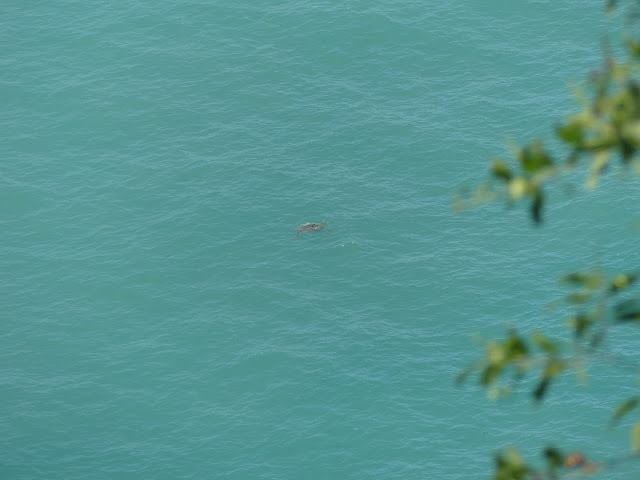 The rocky waters looked deceptively calm that Sunday. 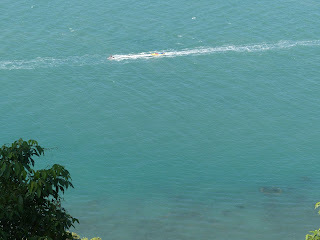 Aqua blue colours of the sea contrasted with the green slope of hill on which the lighthouse stood was beautiful indeed. 1,525 OHBs were counted from 11am to 6pm that Sunday, 6th March 2016. More pictures of the majestic White-Bellied Sea Eagle below as a passing plane flew overhead. There was a lovely Frangipani tree growing in the opposite house of Kin Villa with pink flowers. 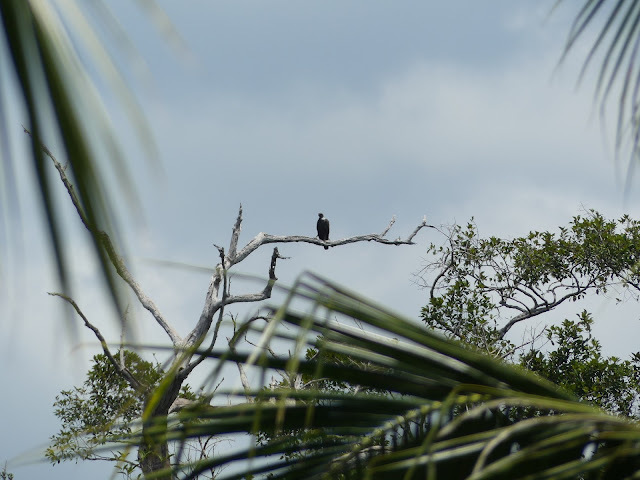 Lineated Barbet hopped into this tree last Saturday evening. 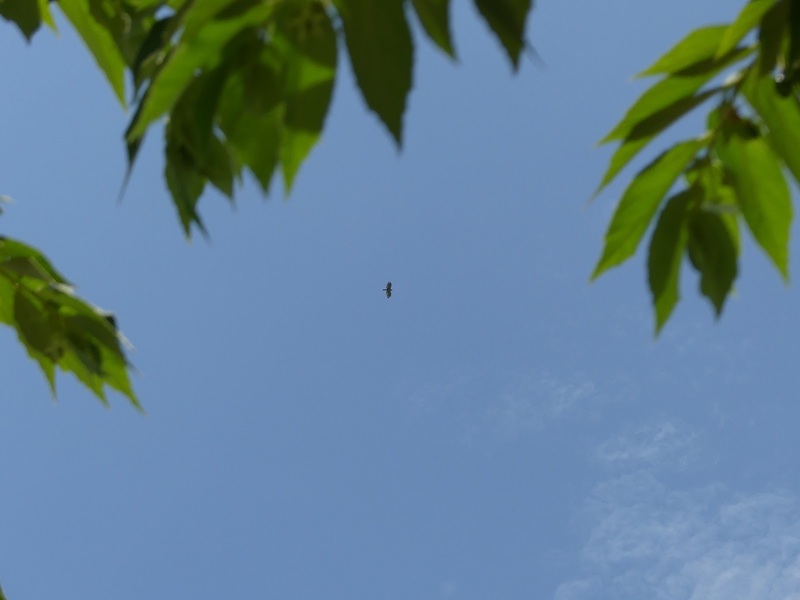 The barbet's green plumage was a perfect camouflage against the green leaves and I couldn't focus my camera in time to take a picture of it, as it flew away. 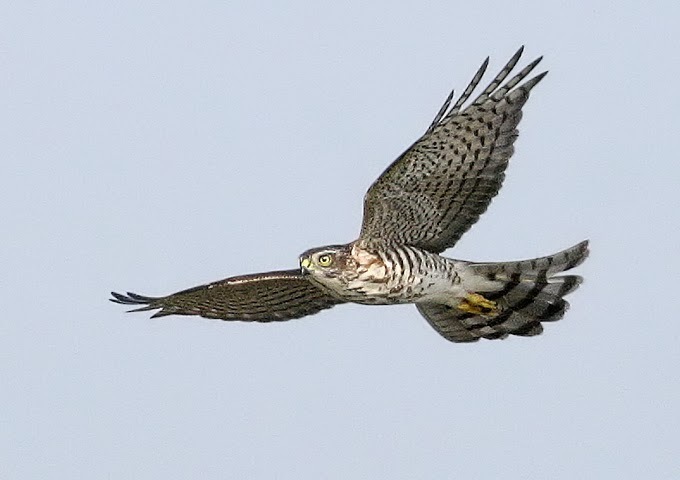 Photographing birds is challenging and yet a camera (other than a bino and field guide) is an important tool to gain a better understanding of and greater appreciation for these winged wonders. Here comes the Oriental Honey Buzzards. 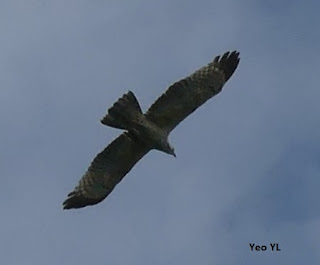 2,754 OHBs were counted from 10.30am to 6pm that Saturday, 6th Day of Official Raptor Count. Counters were myself, Han, Jacky, Andy, Alyce, OT and Cheng Yam. 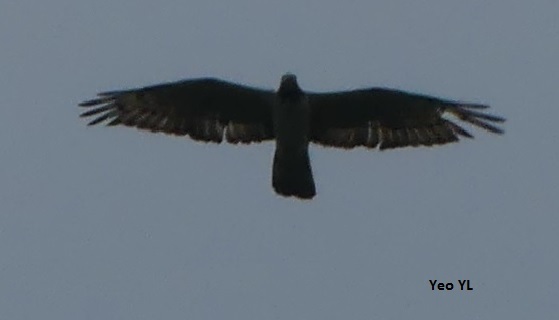 The raptor below is the resident Brahminy Kite. 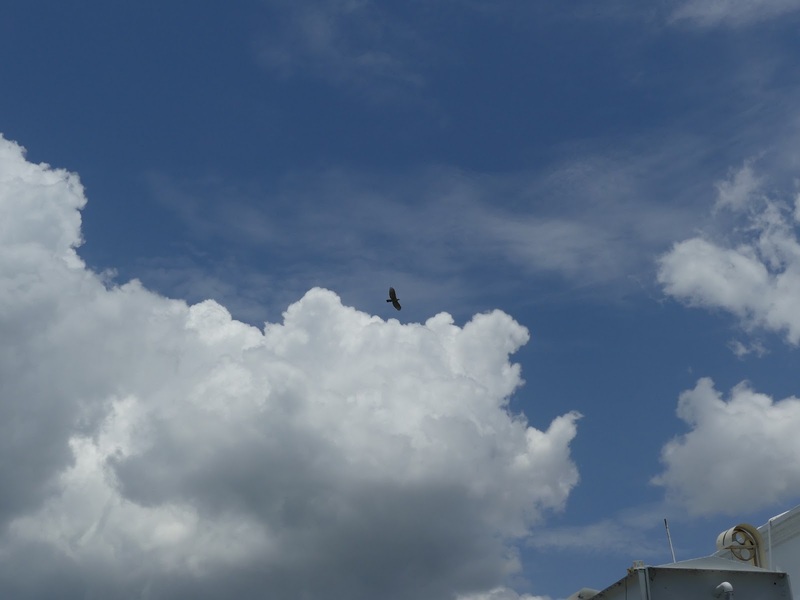 We saw a pair that Saturday morning. 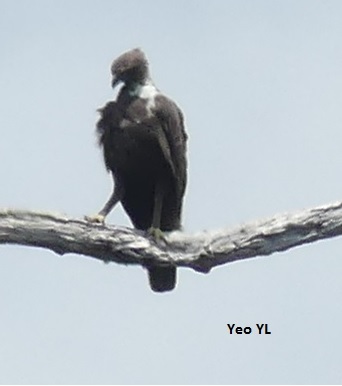 I still remember the side-by-side pictures of Brahminy Kite (juvenile) and Black Kite that Swee Seng highlighted during the Raptor ID workshop last February 2016 where he pointed out how these two different species of Kites look similar especially the juveniles. 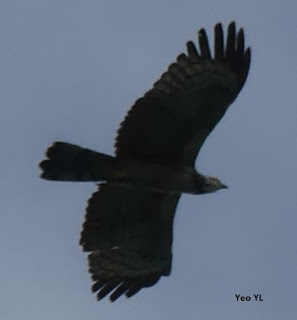 It is only when the Brahminy matures into an adult that the distinct white head and brownish plumage differentiates it from the Black Kite. 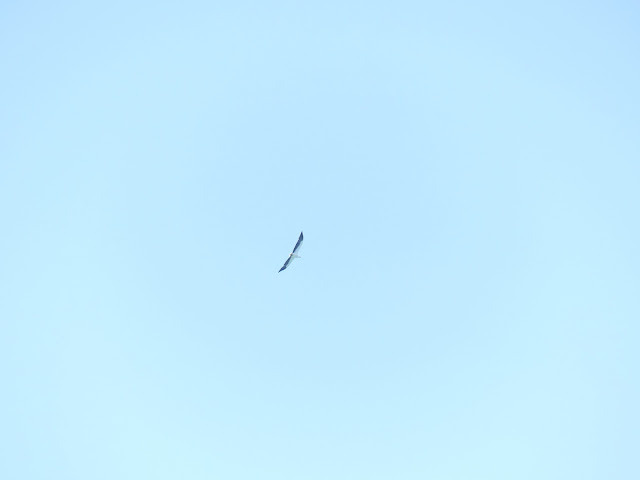 Grainy picture since the Kite was flying high above the Tanjung Tuan lighthouse when I snapped my camera. 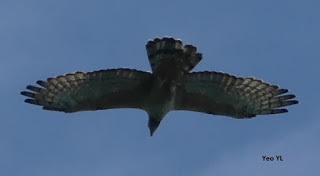 Still grappling with my Panasonic Lumix. 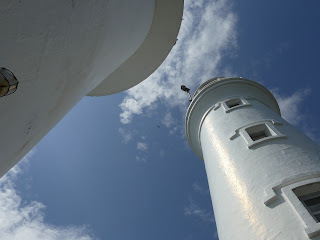 More pictures of the OHBs soaring and flying past the lighthouse that hot Saturday in Tanjung Tuan. 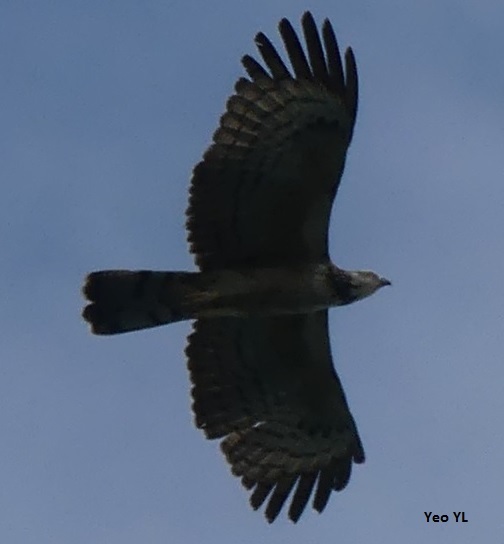 Jacky from Singapore gave me a great tip to hit the +2 button on my camera when taking pictures of birds flying or soaring in the skies. 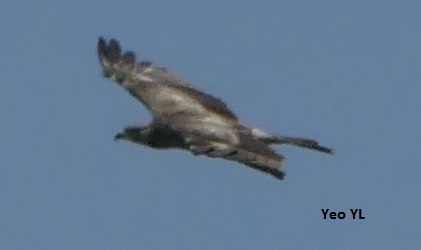 Seems +2 function is a common feature found in all digital cameras. Found this small button on my camera on Saturday night and took these shots of OHBs on Sunday morning. 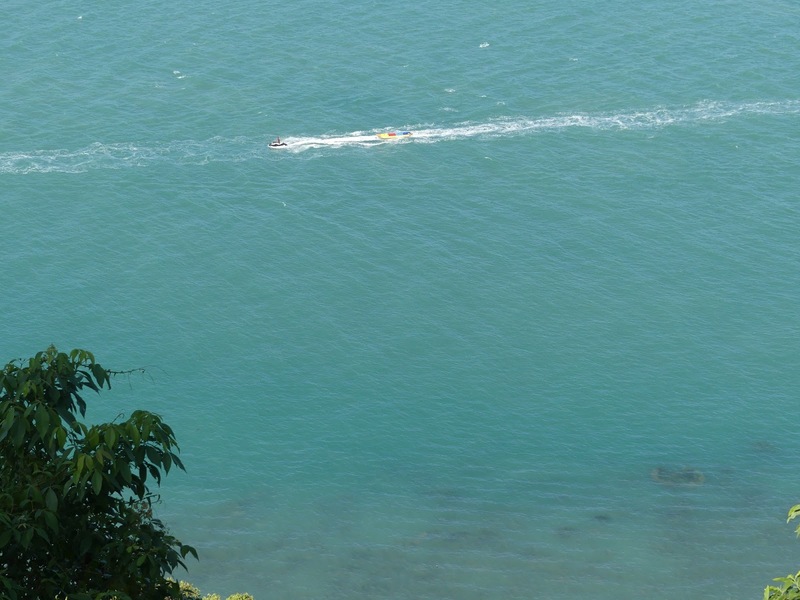 View from the Cherry Tree of an OHB soaring above the waters, Straits of Malacca. We started counting when these OHBs appear as little flecks over the horizon, flying towards Tanjung Tuan and Port Dickson from Pulau Rupat, Indonesia. The passing ships became focal point for us to start our count. 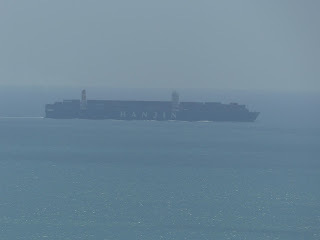 Hanjin was one of the passing ships which we took as the focal point to start our count of the migrating raptors. 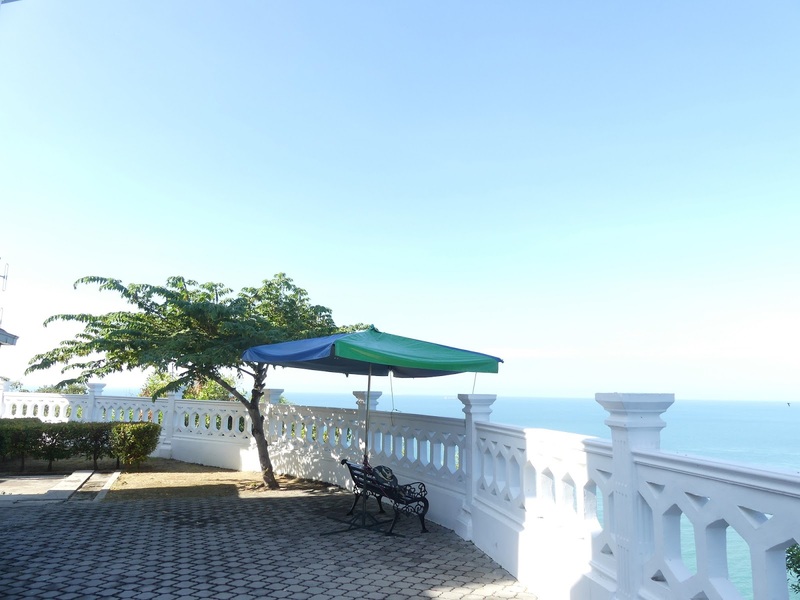 There was a toilet which the lighthouse had granted permission for us counters to use, which was at the entrance to the lighthouse courtyard. 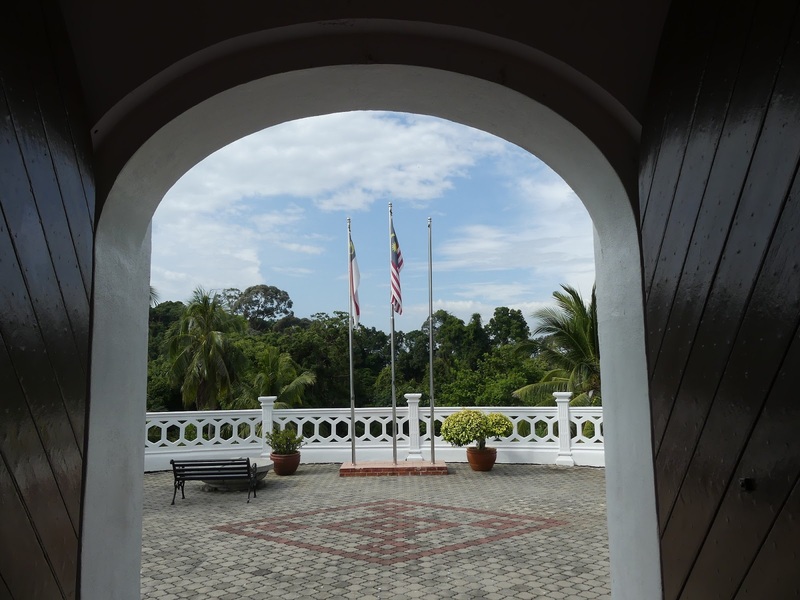 Couldn't resist snapping a picture from within the courtyard. It had a lovely view of the Tanjung Tuan hill forest. Migratory OHBs thermaling in the skies just above the forest of Tanjung Tuan as they begin their incredible journey to the northern parts of Asia. 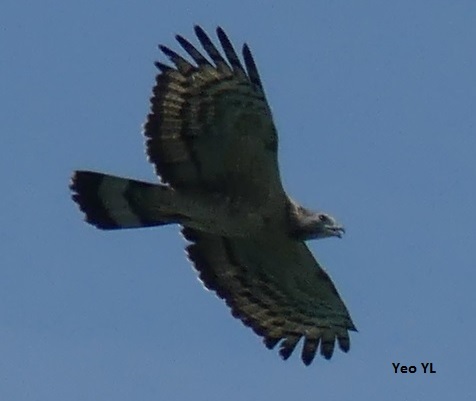 There are a total of 25 migratory raptor species that visit Malaysia out of total number of 421 diurnal and 133 nocturnal raptors, according to MNS Raptor Watch website. 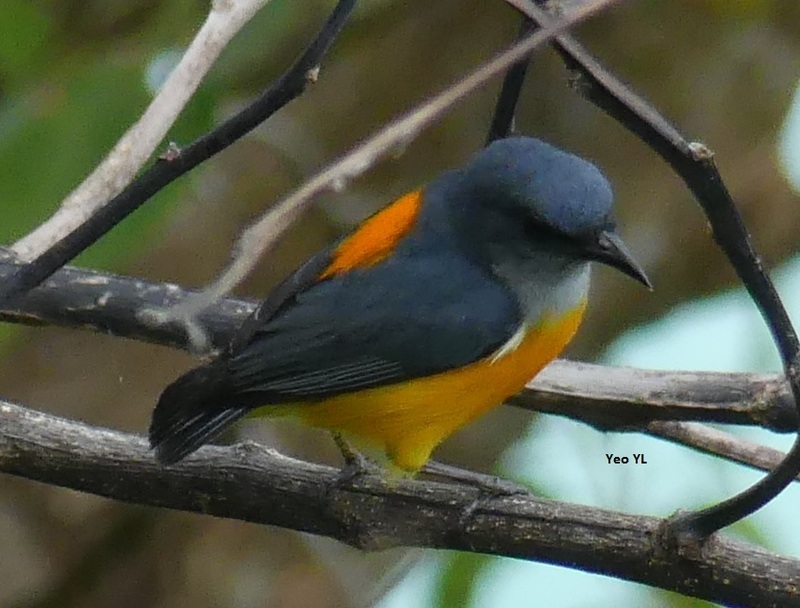 A pair of Orange-Bellied Flowerpecker were flitting about that morning amongst the trees that grew on the hill slope which rises above the rocky waters of Malacca Straits. The lighthouse serves as the warning beacon to caution passing ships against coming any closer to these rocky waters which form a part of the Malacca and Negeri Sembilan coastline. 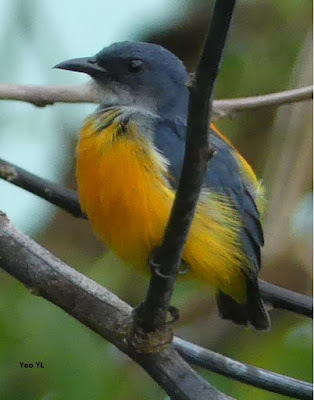 The male and female Orange-Bellied Flowerpecker flew into the Cherry Tree that grew within the compounds of the lighthouse. 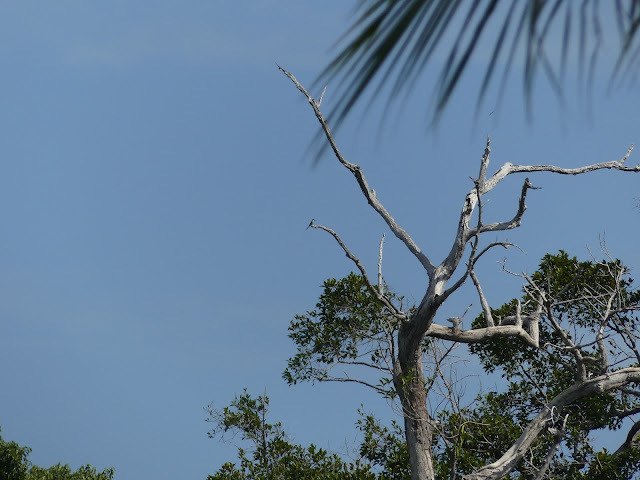 This Cherry Tree provided us counters much needed shade from the hot sun. 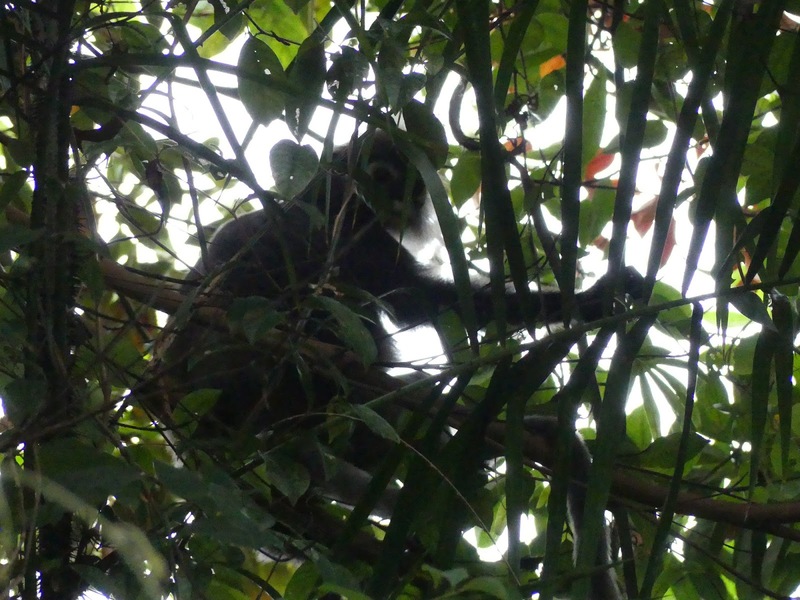 Leaf monkey with baby in golden coat greeted us when we arrived at the lighthouse that morning at 8am. 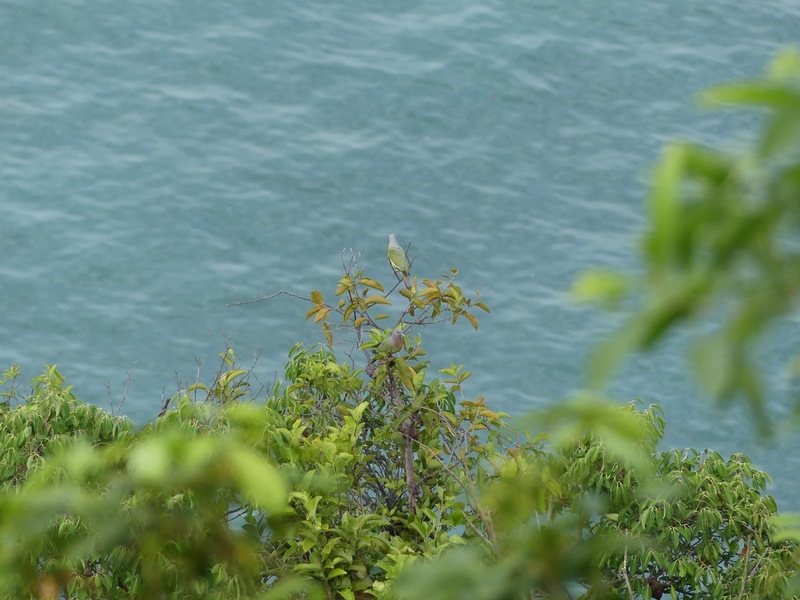 Pink-necked pigeons, a pair (pics below) were perched on tree facing the rocky waters of the Malacca Straits. Also heard bulbuls singing away in the thick foliage and trees. Can only catch a glimpse of them when they flew. Bulbuls had such rich, bubbly songs and all I could see were their brown and olive green bodies. 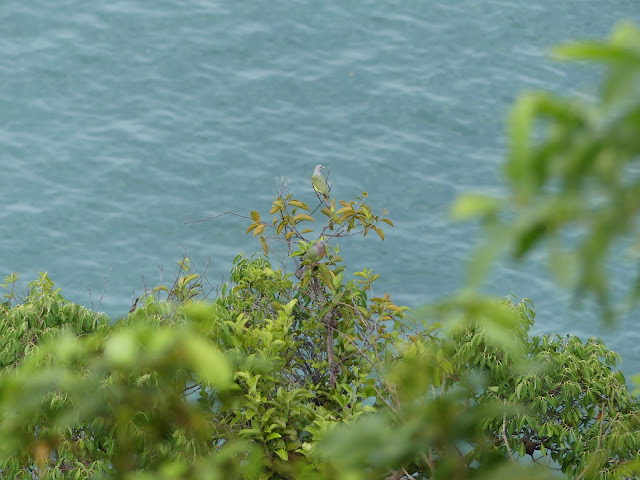 The Blue-throated Bee-Eater perched in this tree on top of the Tanjung Tuan forest, was counted that Saturday morning. 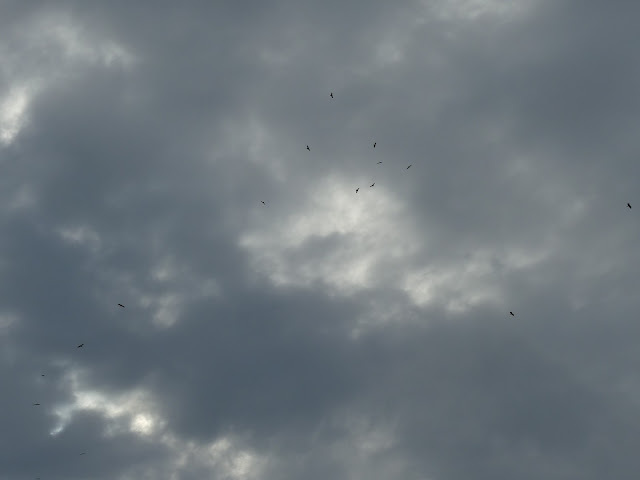 Heard a few bee-eaters later that day but just couldn't see them against the bright skies. 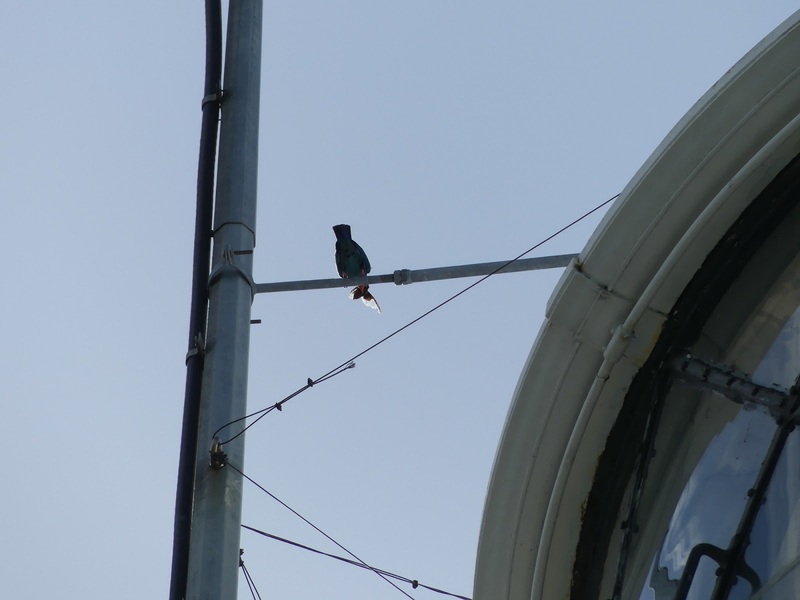 A pair of Dollarbird were perched on the wire near the lighthouse building. 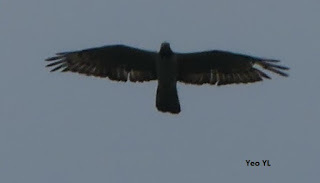 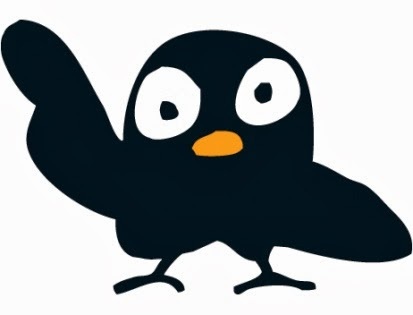 One of the Dollarbirds caught a large cicada which buzzed in alarm and a very loud buzz indeed that morning. 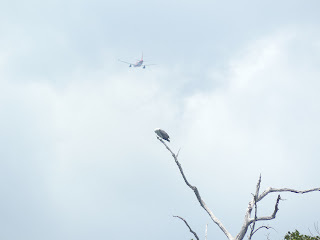 It was the Dollarbird's meal for that day. We saw this same pair again the following Sunday morning with another cicada. 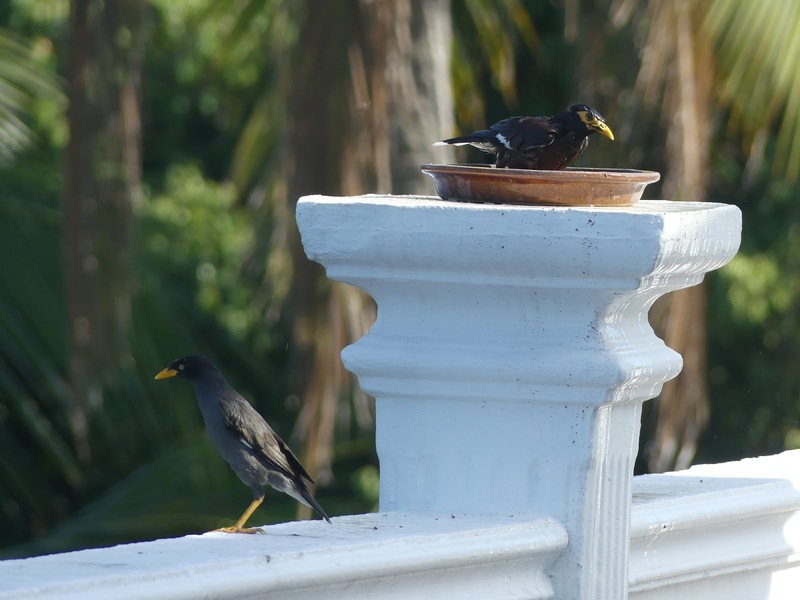 This lighthouse pair of Dollarbirds seem to be having a daily meal of cicadas! 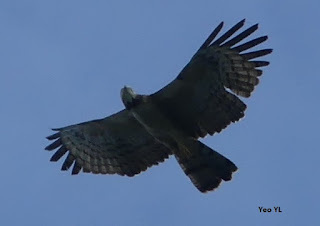 Thanks to Mark Ng for including me as part of the early March 2016 weekend count group. 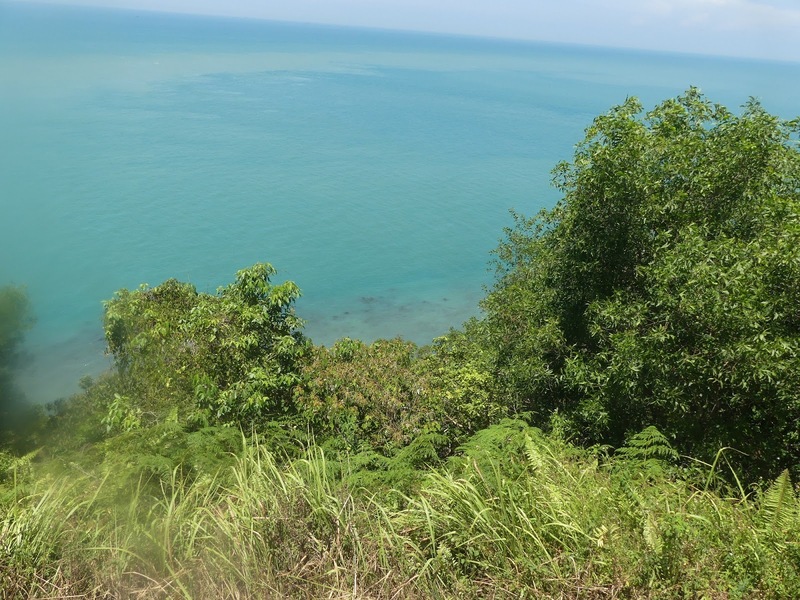 Thanks to Swee Seng for hosting the counters in Kin Villa. 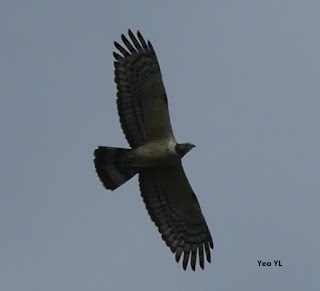 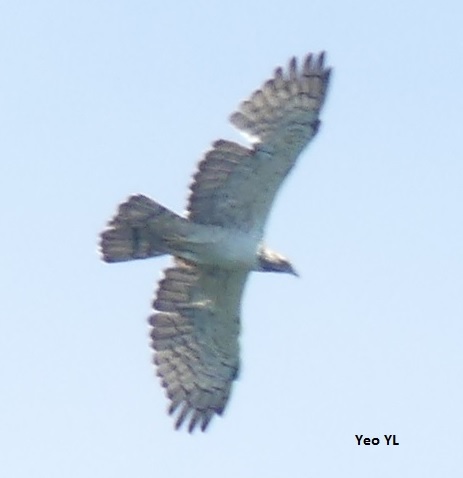 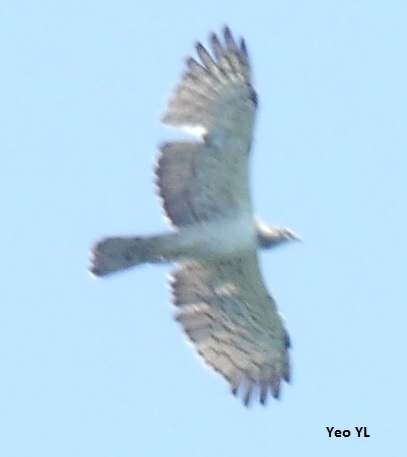 Seng had conducted a Raptor ID workshop earlier in February 2016, pointing out that the five (5) main migratory species were the Oriental Honey Buzzards, Japanese Sparrowhawk, Chinese Sparrowhawk/Goshawks, Grey-Faced Buzzards and Black Bazas. 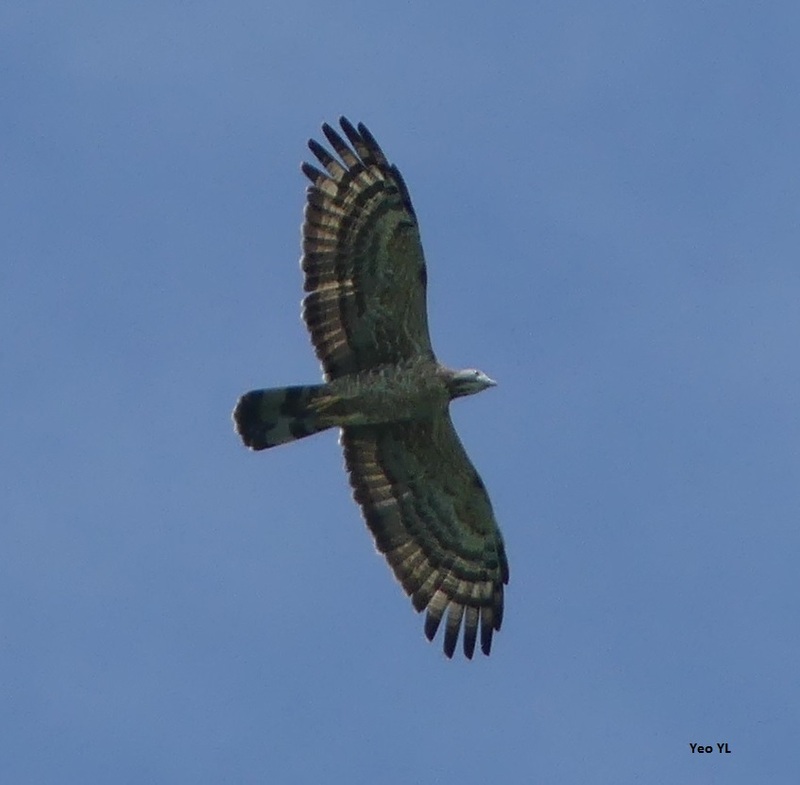 The next blog post will feature pictures of the Oriental Honey Buzzards and a resident Brahminy Kite. 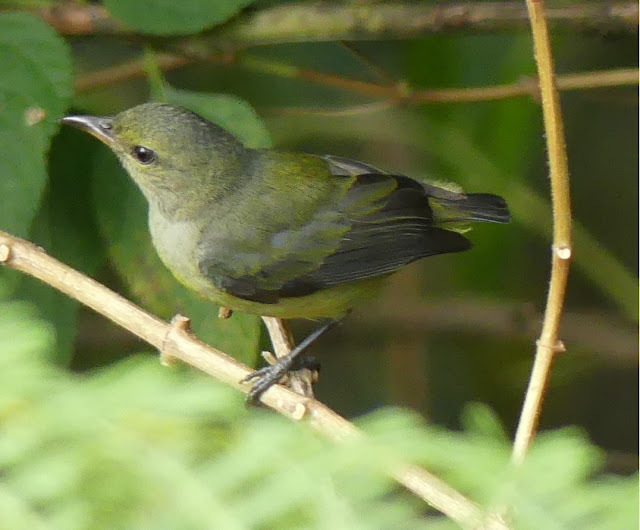 This was the only decent-looking picture of the Mountain Tailorbird, out of the many pictures I had to delete from my Panasonic Lumix. This montane tailorbird species was so flitty that I just pointed my camera at this patch of ferns and clicked away. 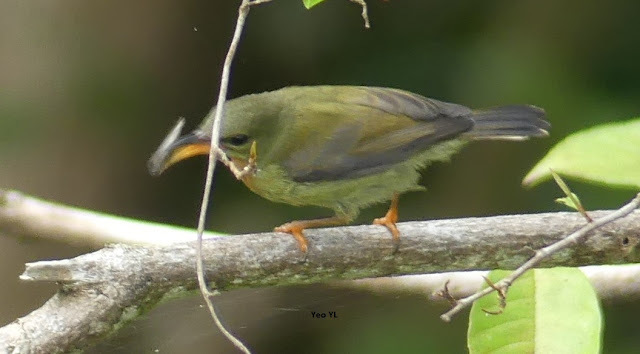 I call this the "Peekabo" Mt Tailorbird pose:) My Birding Sifu Ang Teck Hin and Birding Kaki Raj caught much better and clearer pictures of this Tailorbird. 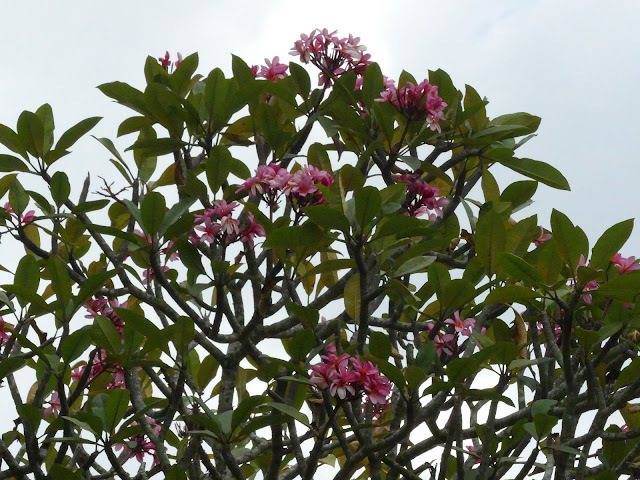 For Ang's Facebook page, see my previous posting on "Genting Highlands Flora and Fauna."